Recently, optional stopping has been a subject of debate in the Bayesian psychology community. 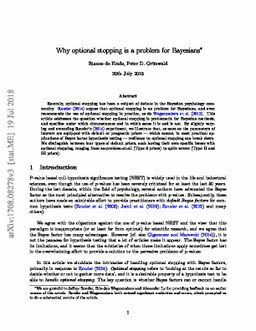 Rouder (2014) argues that optional stopping is no problem for Bayesians, and even recommends the use of optional stopping in practice, as do Wagenmakers et al. (2012). This article addresses the question whether optional stopping is problematic for Bayesian methods, and specifies under which circumstances and in which sense it is and is not. By slightly varying and extending Rouder's (2014) experiment, we illustrate that, as soon as the parameters of interest are equipped with default or pragmatic priors - which means, in most practical applications of Bayes Factor hypothesis testing - resilience to optional stopping can break down. We distinguish between four types of default priors, each having their own specific issues with optional stopping, ranging from no-problem-at-all (Type 0 priors) to quite severe (Type II and III priors). de Heide, R, & Grünwald, P.D. (2017). Why optional stopping is a problem for Bayesians. arXiv.org e-Print archive.